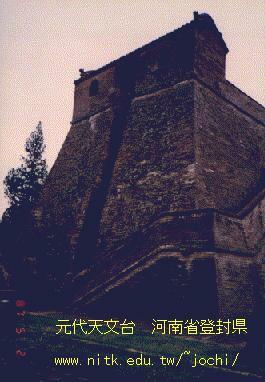 Rutt (Zhouyi, 1996) gives most information. He says (p.88): ”The word gua itself seems originally to have meant yarrow-wand divination, and is written by combining a graph for ‘baton’ with a graph for ‘divining’ that looks like a crack in a tortoiseshell. Perhaps this reflects the bamboo or other slips, shaped like batons, on which the hexagrams were first written”. (p.100-102) The bagua numerals: groups of 6 symbols, the oldest reliably dated ones from the reign of Wuding (1238-1180 BC). Zhang Zhenglang identified them as being probably hexagrams. They usually occur at the end of an inscription, sometimes as two groups of three chevrons placed side by side, most often as a group of six lines, chevrons, or numerals set vertically one above another. When the groups consist of lines, the broken lines may have three parts, rather than two. When the signs are numerals, they are easily recognized Chinese figures from 1 to 9, in groups such as 766718. .. The bagua numerals are much older than any hexagram drawings now known. Little detailed information has been gained about them since they have been identified. .."When the groups consist of lines, the broken lines may have three parts, rather than two".. This was the only thing which I saw as a real counter indication for my idea. All the others are no proof that I am wrong. Maybe there is an explanation for the three lines. The Tai Xuan Jing consists of tetragrams of single, double and triple lines. Maybe in the beginning there were more oracles, with and without triple lines, and not all survived the times. I don't expect to find any real proof, I don't think that is possible after so many centuries. The only criterion may be 'does it make sense'. My search goes on.. Some scholars have wondered whether the counting of days in cycles of sixty, giving six ten-day ‘weeks’ to a cycle, underlies the hexagram form. In late Shang times tortoise-shell auguries were taken at the beginning of each ten-day period, on the gui* day. Hexagram 55.1 may reflect this usage. The results of these divinations were inscribed on oracle bones in columns containing six items, often read from bottom to top. [James Menzies proposed the idea that this custom may have suggested the hexagram form of Zhouyi (Kunst p.23, Shaughnessy 1983 p.109f). Kunst (p. 23, about Menzies): "The typical series of six ten-day week divinations comprising a full 60-day sexagenary cycle corresponds to the six line texts of a hexagram. .. In Japan Naito Torajiro (1923) and Kaizuka Shigeki (1947) reached a different conclusion, they successively developed the idea that the six lines of a hexagram corresponded not to the divinations for the six ten-day weeks, but to each day of a ten-day week. They argued .. there were only five lines to a hexagram chapter, and a pair of adjacent chapters formed one large one of ten lines. 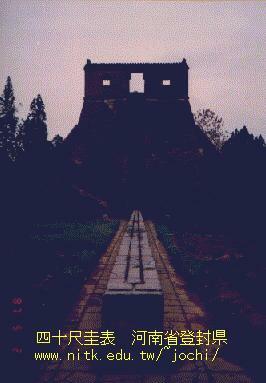 .. when the Zhou took this system over from the Shang, they modified it to fit their own calendar of four lunar phases, which was tantamount to a month of four seven-day weeks. Like the Shang, the Zhou ignored the last day of the cycle, leaving a total of six days, .. the oracle sayings were thus also arranged in corresponding units of six, rather than in nine as with the Shang (It has been confirmed by Prof. K. Takashima that there is indeed an absence of gui-days in .. divinations. Gui day may have been a day of rest or of taboo on which nothing, except the ten-day divination, was conducted". Kunst p.220, note 13). * This gui is a different character than the 'sundial'. 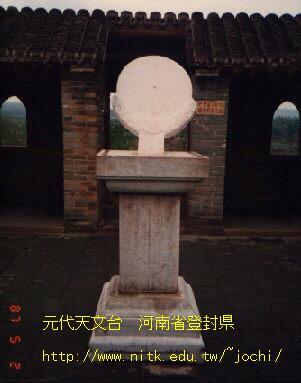 It is the tenth stem or calendrical sign, 'yin water'. It can be found back in the name of hexagram 38. 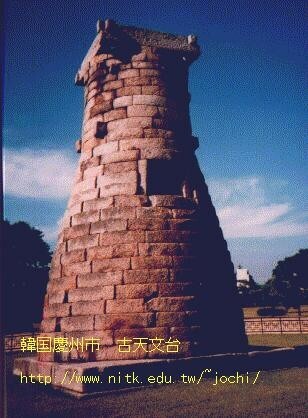 Duke Zhou's Gnomon?, Dengfeng-xian Observatory in the Yuan dynasty. 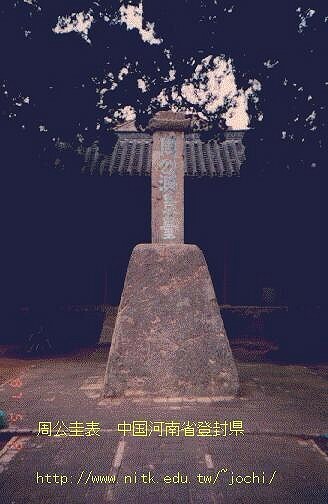 40 chi Gnomon in the Yuan dynasty, Dengfeng-xian Ancient Observatory, Dengfeng-xian, Henan, China. 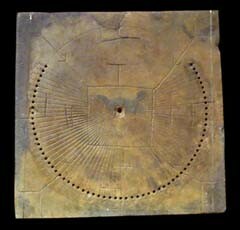 The gnomons (above) indicate the seasons, the round sundials (below) indicate the hours of the day. 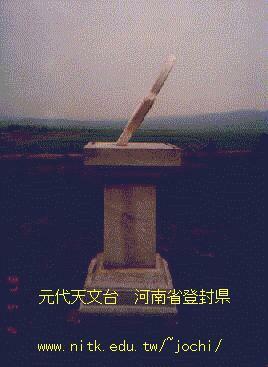 Sundial, Dengfeng-xian Observatory in the Yuan dynasty.